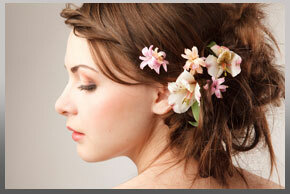 iLLustria Hair Salon in Milwaukee WI offers the complete journey for our brides. We do everything from the trial for your wedding hair and makeup to giving you the perfect spray tan for a beautiful bronze glow. To accommodate all of our brides’ needs, we have both “in –salon” as well as “on-site” wedding hair and makeup services, and different pricing options are available. We also have gorgeous hair extensions, eyelash extensions, and multiple nails salon services that will leave your hands and feet feeling pampered and satin smooth before you say “I do”. What color is best to paint your nails? How far in advance should you schedule a waxing or tanning appointment? Should you get a new hair color the day before the ceremony? What is the secret to beautiful shiny hair? We have all the answers! Next to your dress, your bridal hair style and makeup are the most important reflection of who you are. Our experienced stylists and makeup artists are masters at creating customized styles that will capture your vision. Our countdown to the big day will help you to plan when to schedule your appointments for hair, makeup, spray tanning and waxing, and a professional manicure and pedicure for a complete transformation. Not sure which hair style is right for you? Our experienced bridal hair stylists will work together with you at your appointment to design a customized look just for you. Browse our gallery below by clicking on the link, and view our collection of beautiful styles. From classic chignons to elaborate updos, our artistry is unequaled. Don’t forget about the bachelorette party and your rehearsal dinner. 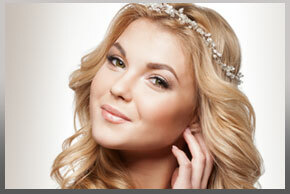 Call today to set up your wedding journey with iLLustria Hair Salon in Milwaukee WI.